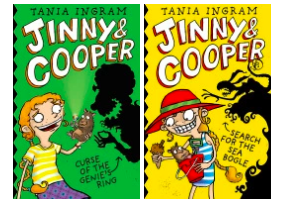 Towards the end of Term One, I introduced the Year 3 classes to the new Jinny & Cooper series by Tania Ingram and the books were a big hit! I wanted to build on the interest for this series, but it’s tricky to do in depth work on a novel when you only see classes for 45 minutes once a week. 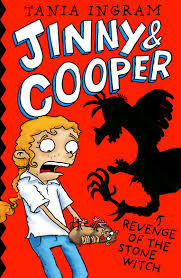 So I asked Miss Mc who teaches 3MC if she would like to read the Jinny & Cooper books to 3MC and then work with me in the library on a Friday. Miss Mc did a fabulous job reading and discussing the books with 3MC. 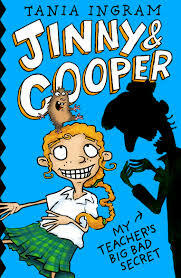 At our first session in the library we talked about what we liked about the books and which was our favourite book and character, with both The Revenge of the Stone Witch and Cooper the guinea pig being the clear winners. 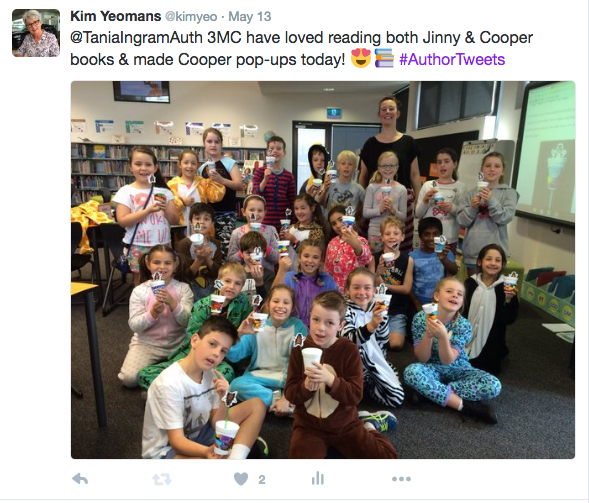 Then 3MC had fun making Cooper pop-ups from Tania’s website and I tweeted our Cooper pop-ups to Tania. Our second session in the library had students thinking, sharing and recording their responses to the books. 3MC discussed how the first book, My Teacher’s Secret was important because it introduced each of the characters. In the second book, The Revenge of the Stone Witch, Tania developed the story using exciting cliffhangers and created a mystery that wasn’t solved until the very end. The third session was a busy one with 3MC exploring Tania’s website to learn a bit more about her. Then 3MC were VERY excited to hear they were going to talk to Tania via Skype! In small groups they brainstormed questions to ask Tania under the headings Life, Writing and Books. 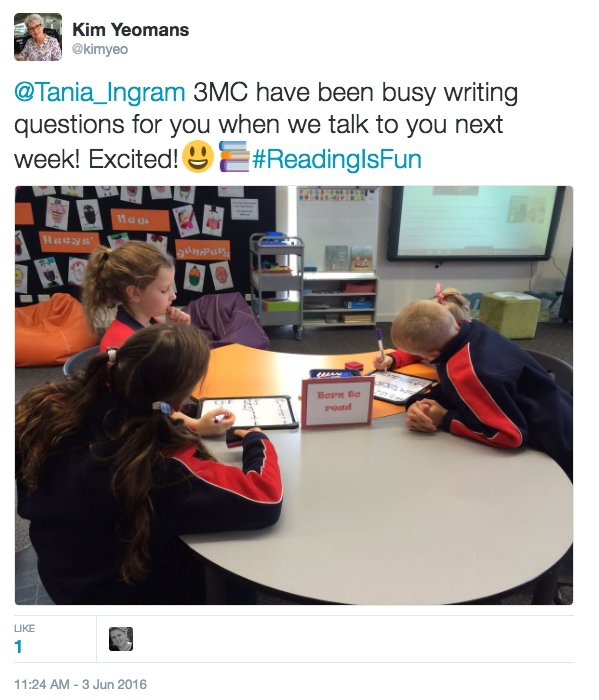 Those questions were then shared and finalised to create a set of questions to ask Tania. Last Friday was the BIG day and 3MC arrived in the LRC full of excitement (and some nerves) to find the chairs set up in front of the IWB ready to Skype Tania. Miss Y had tested Skype earlier in the week to make sure it worked BUT there were gremlins around! Miss V came and helped to get the microphone working, but when we tried to skype Tania the call FAILED each time. Tania suggested we try a Google Hangout…and it worked!!! 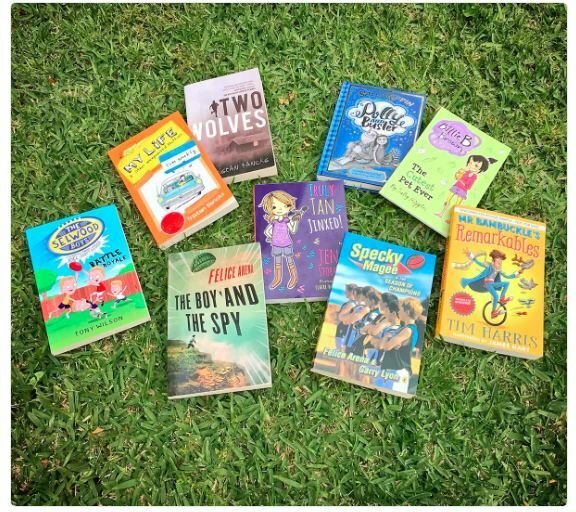 Thanks to technology we were able to sit in our library in Melbourne and hang out with Tania at her house in Adelaide to talk to her about her books and writing….what a fabulous Friday morning in our library!! Tania really enjoys creating and writing stories. 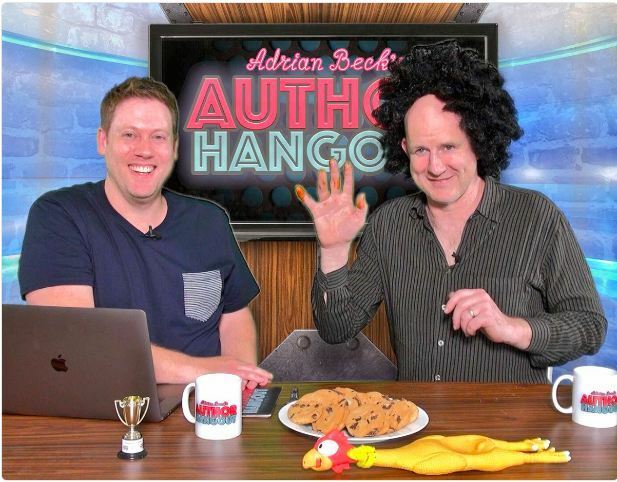 When I received an email from our author friend Adrian Beck with the subject “Crazy idea”, I was a bit worried about what I might find inside when I opened it! 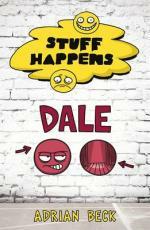 I shouldn’t have worried though, because Adrian had a fun and creative idea he was hoping some of our students could help him with for his new book Stuff Happens – Dale. How could I say no to making a life-sized book cover? A big thank you to the boys who did a fabulous job working as a creative team with Adrian and helped to bring his crazy idea to life. 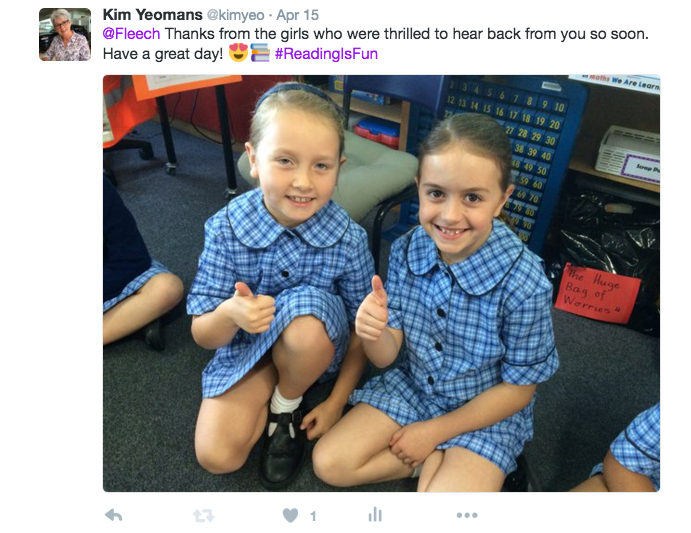 Thank you for asking us to help you Adrian and for making reading fun! 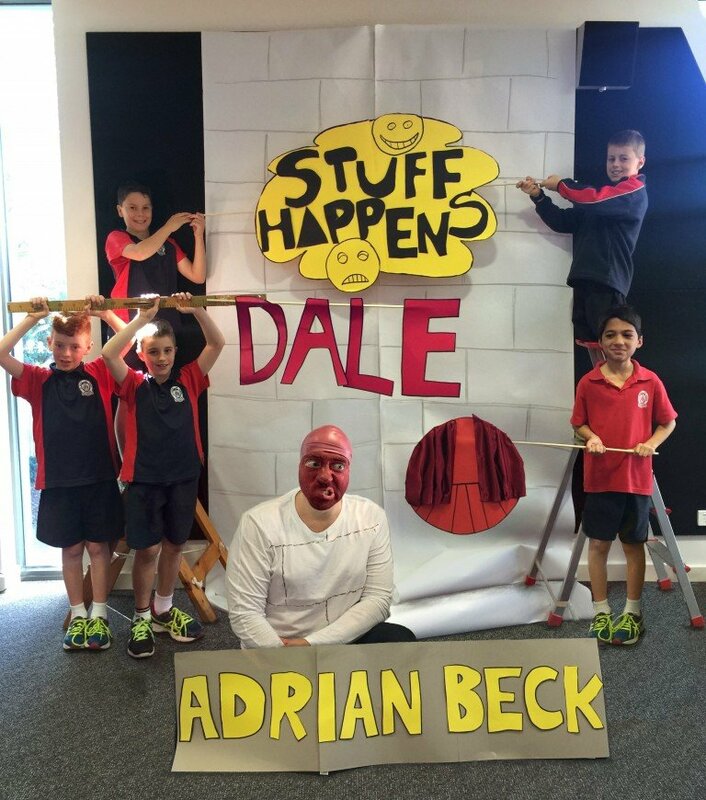 You can read all about making the life-sized book cover on Adrian’s Blog…. Before school during BRB time, two students brought me two books to ask if Jacqueline Arena was Felice Arena’s sister? “What a great question!’ I replied. “Why don’t we send a tweet to Felice Arena and ask him?” I took a photo and added our question to a tweet. By the time they had unpacked their bags in their classroom, two very impressed girls had their answer from Felice! 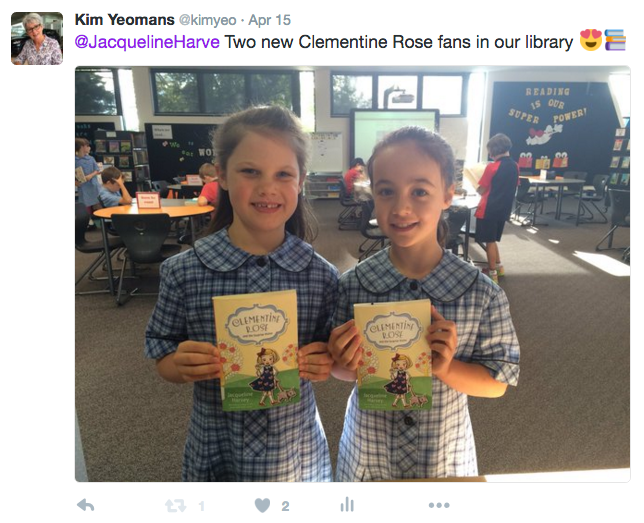 Two more students excitedly showed me they were both reading the first book in the Clementine Rose series by Jacqueline Harvey. The girls were excited to have their photo taken to tweet to Jacqueline. 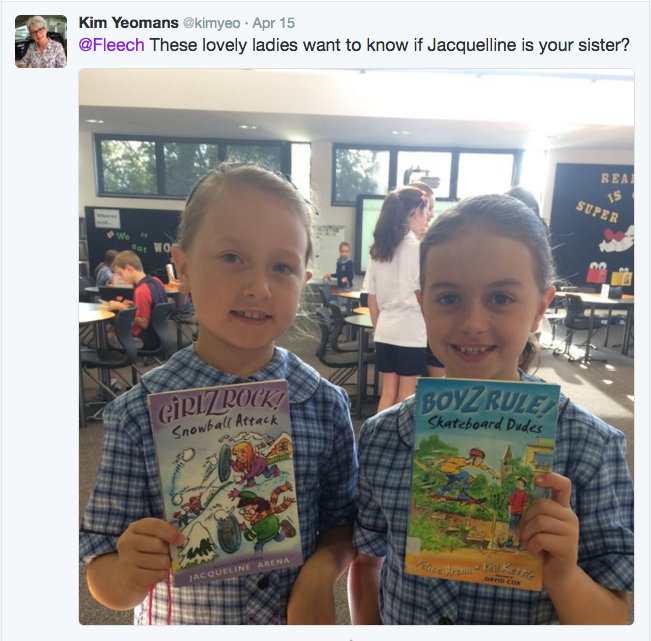 Jacqueline’s reply showed she was thrilled to see she has two new readers who have discovered her popular Clementine Rose books and the girls were even more thrilled to hear back from the author of their book! 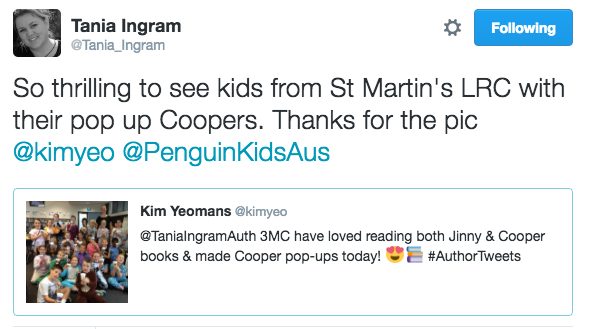 These are three small examples of the power of Twitter as an authentic way of connecting readers, authors (and teacher librarians). 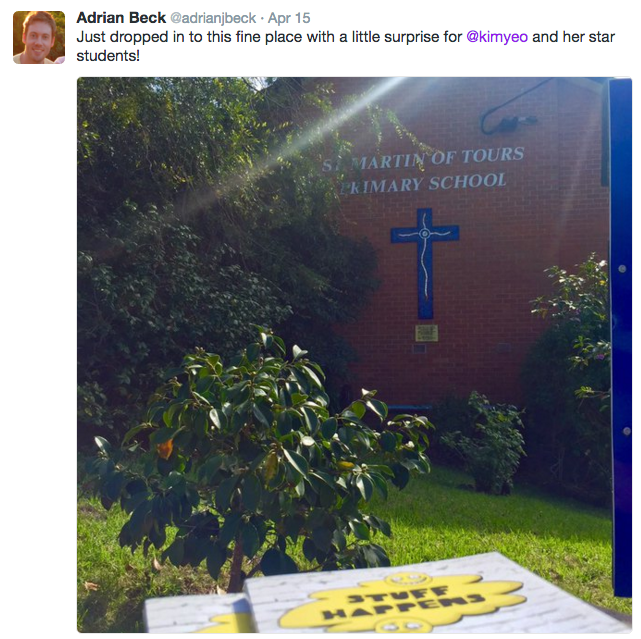 A BIG thank you to Felice, Jacqueline and Adrian for using Twitter to connect with their readers in such a positive way!